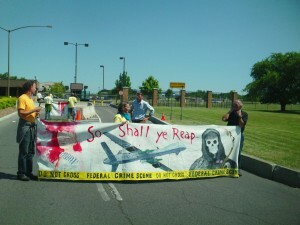 On June 28 at 1:41 p.m., 15 New Yorkers were arrested when they blocked the main gate of Hancock Air Base in Syracuse, NY, unfurling anti-Reaper Drone banners. 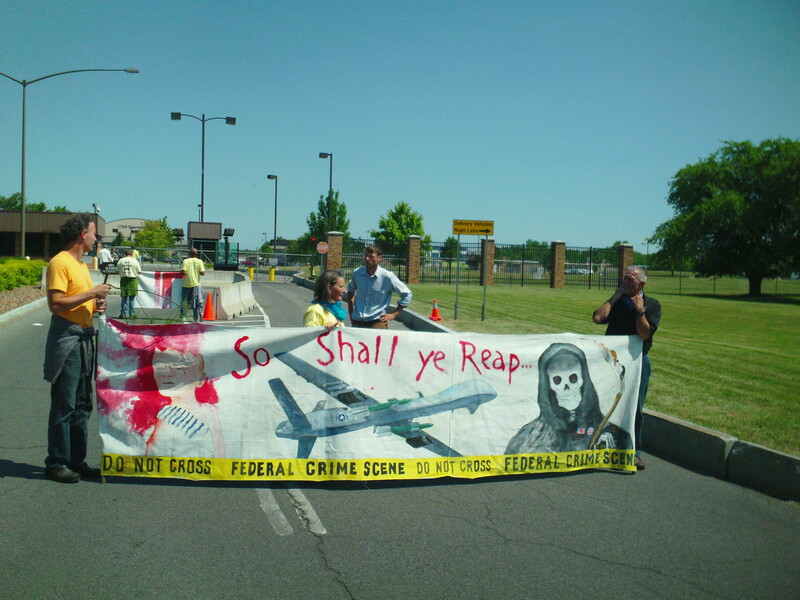 The banners declared, “Federal Crime Scene, Don’t Cross!” with vivid illustrations of young victims of Drone strikes. One banner pictured Martin Luther King, Jr. stating “I have a dream!”, and next to him was Obama stating “I have a drone”. What has happened to MLK’s dream? A war crimes indictment was read aloud, against the entire chain of command from President Obama on down, for crimes against peace and crimes against humanity, to base personnel at the gate. Shortly after the arrests began. Clare Grady, Mark Scibilia Carver, and Ed Kinane were jailed for non-compliance of former community service requirements from a previous drone protest sentencing. They’re being held in the Syracuse Justice Center. Their arraignment is set for July 3rd at 6 p.m. in front of Judge Gideon. The rest of the group were released without bail. Hancock Air Base is one of dozens of military drone bases in the U.S. It is central New York’s hub for the piloting of the MQ-9 Reaper, an unmanned high-tech airborne killer robot, over Afghanistan. These drone incursions violate the U.S. Constitution, Article 6, and International Law. U.S. drones clandestinely kill civilians and noncombatants in various countries including Afghanistan, Iraq, Yemen, Somalia, Pakistan, and the Philippines. Simultaneously, over 40 people gathered to protest the drones at the Syracuse Federal Building. There was a press conference, including a public reading of the war crimes indictment. Copies of the indictment were hand delivered to Senators Gillibrand and Schumer’s offices. The resounding sentiment of the two groups gathered is that we will not be silent and complicit with our government’s drone strikes, assassinations, and Obama’s Infamous Kill List. Arrested were all from the Upstate Coalition to Ground the Drones and End the Wars.